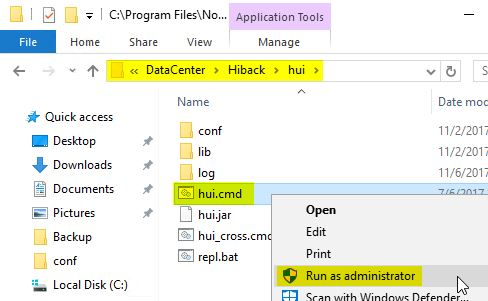 You can re-index and then restore the contents of an .SV (DataCenter save file/backup set) file via command line via hiback.exe even when the index record/index file for the .SV is not present anymore or became corrupt. Attempting to restore an .SV file in this manner is just bit more complicated than attempting to perform the operation on a .SV file that is stored on a local device such as a local hard drive, as there is the added step of mapping a network drive letter in via an escalated/admin command prompt so that the hiback command can see the .SV file on the network location such as a NAS or network share. In addition, if the NAS share/network share is protected and not open to everyone then you will need to know the username and password for the credentials to the share to be able to map a network drive letter to it. 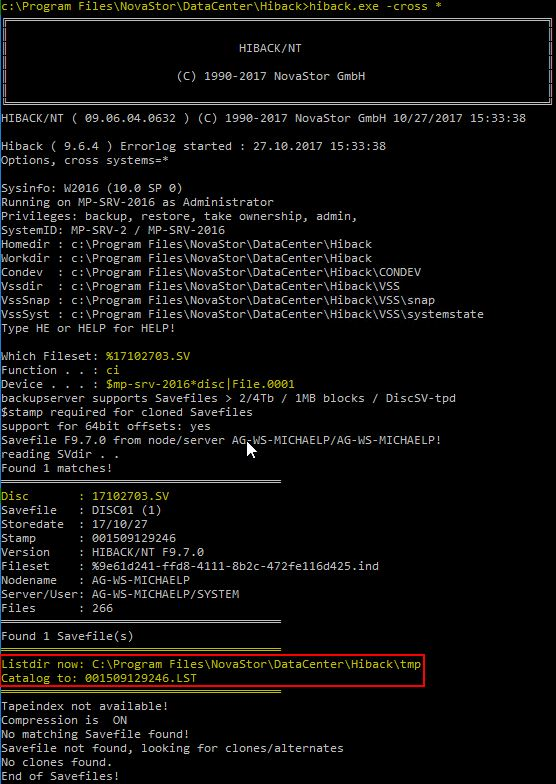 To perform a direct restore from a backup .SV file (save file/backup file), launch an elevated (Administrator) command prompt and perform a drive mapping of your NAS share or your network share. First of all you need to realize that if your .SV file (save file/backup file) is on a NAS share or a network share that is protected (user and password, possibly different than the user that you are logged in to Windows with) then mapping a network drive as that other user while logged in to Windows won't be acceptable here since the command line session loads an Admin command prompt and those drive mappings are different than your other user that is logged in to Windows so the command line session won't see your own network drive mappings. 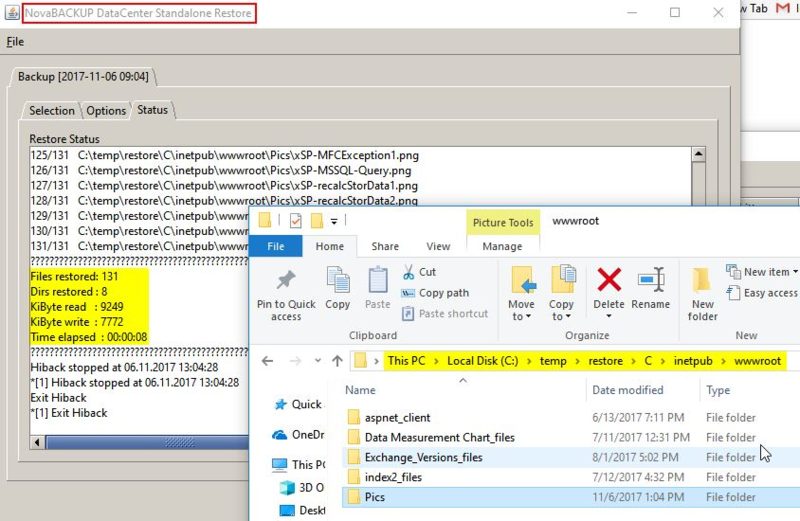 Now verify that the Q: drive is mapped in the Admin command prompt session by performing a "cd q:" command via the same Admin command prompt session. If you are able to get to that newly mapped in network drive and then do a "dir" file/folder listing there then you have read permission to the Share and should now be able to reference the mapped drive during the "Which Fileset: %q:\Jon\QA-VMS-2012R2A\File\qnap.0001\1809120x.SV" part of the instructions, where you select the .SV file to restore, it will be able to read the .SV at that network location to be able to use it for restoring files. 5) When the "ci" command for re-indexing the .SV file is successfully completed, the output will be similar to the example below. 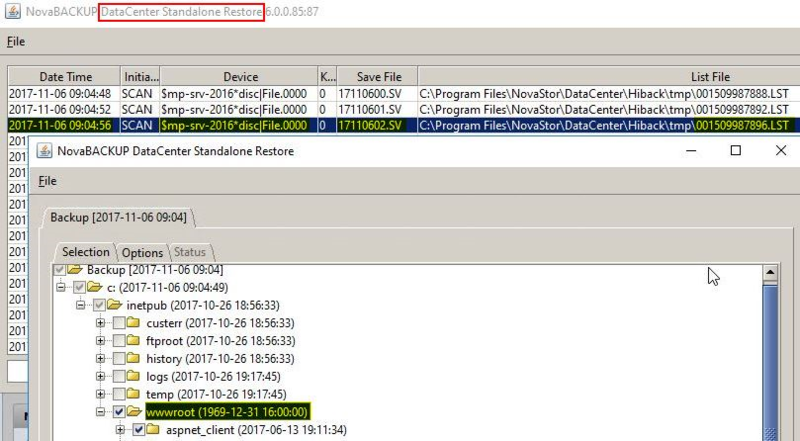 The NovaStor DataCenter Standalone Restore interface can be used to restore data to a backup client (run GUI on the backup client). 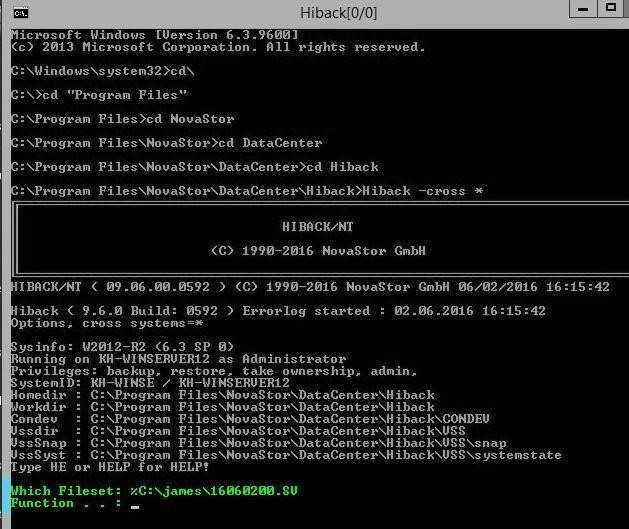 1) To launch the interface browse to the "C:\Program Files\NovaStor\DataCenter\Hiback\hui" directory. 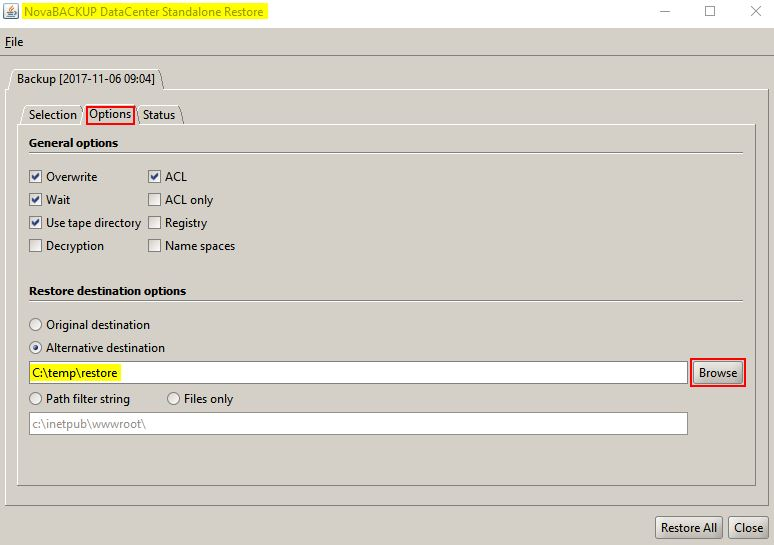 *Note that if you only want to restore a single file or folder from the backup set, as you chose in the prior selection / screen, you will be required to select the option "Path filter string", otherwise ALL files and folders will be restored from your selection set. Note: hui.cmd may also be used to perform restores but, hui_cross.cmd is the tool recommended for restores.